The private security company at the centre of last week's deadly armoured-car heist in Edmonton, Canada, is conducting an internal investigation and will, if necessary, rewrite its policies or procedures to improve safety, its head said recently. New Jersey nurses, locksmiths and accountants might not have to wade through as much red tape to obtain a professional license if a bill sponsored by Assemblyman Scott Rumana becomes law. Legislation streamlining the state's licensing procedures was approved Monday by the Assembly Regulatory Oversight and Gaming Committee. In news from Australia, a security guard who was allegedly beaten to death by a couple in an inner-city shopping centre may have wrongly assumed they were stealing from an ice-cream kiosk. According to the report in the Sydney Herald Hans Schulz, 69, was allegedly attacked by Adrian Gallaher and Svetlana Avrashkova at the Broadway shopping centre in Sydney on Sunday night when he approached them as they were allegedly breaking into an ice-cream kiosk on the ground floor. Following on from last week's comment that security guards will begin to patrol city streets the head of G4S now predicts that large parts of the police will be privatised "within five years." Good or bad, that remains to be seen, but this week we're also seeing an NHS Trust in danger of going bankrupt after a private finance initiative. So where private money gets mixed in with public money, our view is that no good can come of it. The rise in metal theft continues to make the headlines, and we have two related stories this week. Legislation is under consideration in California that will indefinitely extend an exemption granted to certain European car companies from meeting requirements to provide access to key codes such that consumers can obtain convenient and affordable replacement keys as well as perform many security-related repairs. Under a law enacted in the state in 2006, vehicle manufacturers were required to make security information available to the vehicle owner through a licensed and registered locksmith for all 2008 model year newer vehicles. At the time, certain European car companies requested and received a temporary exemption from the law due to the issues that would occur through changing their system for replicating keys by the 2008 model year. That exemption is due to expire on Jan. 1, 2013. ALEX The Auto Locksmiths Exhibition to be held at East Midlands Conference Centre, Nottingham on the 27 and 28th October this year grows in strength as it is announced that there will be some exciting new concepts at this years show. Criminals and rival states are using cyber terrorism on an 'industrial scale' to attack Britain's Government and its biggest businesses, the head of MI5 has said. State-sponsored espionage has already cost one UK listed company a fortune after hackers stole details of a contract and scuppered a £800 million deal. The Association of British Insurers (ABI) has reported that UK metal theft has doubled in the past five years to about 1,000 reported incidents a week costing the UK economy over £770m a year. Nick Starling, the ABI's director of general insurance, said: "Metal thieves are putting lives at risk, causing expensive damage and massive disruption. This is why we are working with the Government to crack down on metal thefts." Operation Tornado, spearheaded by the Association of Chief Police Officers (ACPO), aims to make it easier to trace sellers of stolen metal through an identification scheme. Operation Tornado will launch in all forces across the south of England in the week beginning Monday, 25 June. Did you know that you can get TradeLocks' very best prices online with a trade account? And now thanks to all their valued customers who have left feedback on the site, they've made several changes to the website to make the ordering process easier and faster for you. 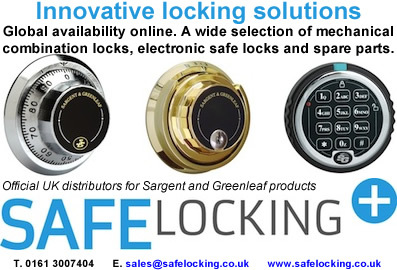 The most noticeable change is that you now no longer have to go into each individual product to add it to your basket, just choose your quantity and click 'add to basket' in the product overview - ideal for quickly placing orders for cylinders and mortice locks. An Atlanta jail is offering $20 worth of commissary items to the inmate who can defeat its new lock system. Fulton County Jail inmates have been able to break the current locks of their cells and roam free, which compromises the safety of the jail, said Tracy Flanagan, public information officer at the Fulton County Sheriff's Office. Private companies will be running large parts of the UK's police service within five years, according to the world's biggest security firm. David Taylor-Smith, the head of G4S for the UK and Africa, said he expected police forces across the country to sign up to similar deals to those on the table in the West Midlands and Surrey, which could result in private companies taking responsibility for duties ranging from investigating crimes to transporting suspects and managing intelligence. Locksmith Exhibition is virtual sell-out with 9 months to go! The Locksmiths Exhibition - held annually at The East Midlands Conference Centre in Nottingham and organised by Locks & Security Magazine editor Mick Friend, has reported a record uptake of stands for the next year's event in March 2013. The London Fire Brigade revealed that firefighters are being called out almost once every hour to rescue people who have locked themselves in or out of a building or vehicle. Over the last three years, the Brigade was called out to around 22,000 incidents involving people being locked in or locked out - costing taxpayers around £5.7m.